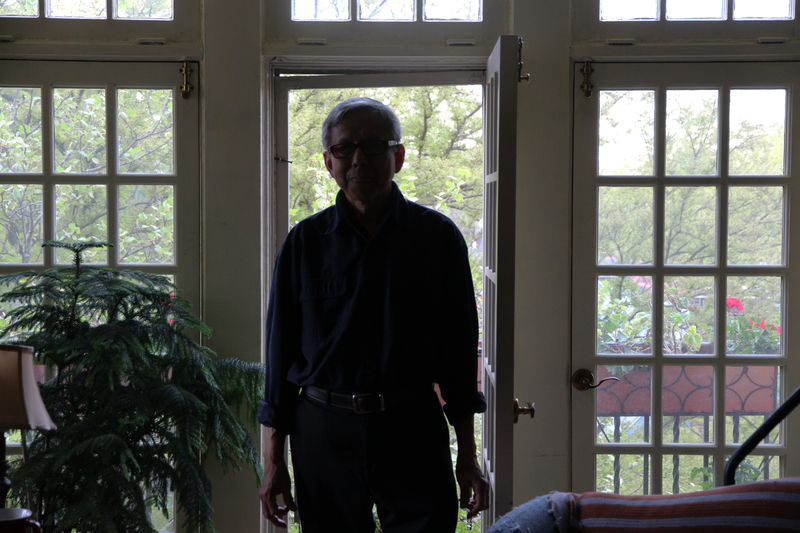 Lao-Sa worked for City of Philadelphia Human Relations Commission and is now retired. Lao-Sa means “old snake” in the Hakka language. One of my sisters, I have three sisters, came to the US and became a citizen, then my next sister also become a citizen. The first one came back to Malaysia for a visit in 1979 and brought up the subject. “I am a citizen now, do you know you can try to come to America?” It was easier to come to America then. It took three months to get the visa and go through the immigration process. Now it can take years. It was sudden thing, we didn’t think of it before. The idea seemed distant and so improbable. We first talked about it as a family and then each person did his or her own thinking about it. There were six siblings, and the decision was made right there. The idea started to cook and there was a consensus of let’s do it. But each person had his or her own imagination about what it meant to go to America. We were Chinese Malaysian and opportunities were limited for us. The Malays were the original people like the Native Americans in America. The ethnic Malay were always on the alert about not letting the ethnic Chinese becoming a significant political threat. When the British gave up Malaya in 1957 they negotiated with the ethnic Malays to take power. The Malay government didn’t take long to set up regulations for national groups. Malays were to be considered the children of the land and as such entitled to special privileges—preferences for college, for business, etc. These were arbitrary and high-handed laws. As a result non-Malay ethnic groups were struggling with their opportunities taken away. When there were elections, the party with most Malays always won. One time a party with many Chinese won and there was a celebration on the street, and next thing you know there was a riot leading to deaths. I was in my late twenties when I came. My father couldn’t make up his mind to come, and then he passed away before we left, but my mom came with us. We emptied out our savings from our jobs, the “public cumulative funds.” I had less than 2000 Malaysian dollars, which were three times less than US dollars. Nobody had much money. I was working as a middle school teacher in Sabah, Malaysia. The decision to come was mostly economic and for opportunity. All we knew of America was from the few TV programs that were exported to that part of the world. We saw The Saint, which actually was a British show, and The Munsters, and a few movies with white folks by the pond sipping champagne with nice clothes and talking stylishly. When I was a child we went through a period of extreme poverty. My father was a Chinese doctor, an herbal doctor. He had a good number of patients but he didn’t know how to manage his business. He was terrible when it came to providing for us. My mother had to be very creative to feed six children. You could make a meal by making small cakes out of starch for five or ten cents. She would also get little dried fish from the market for very cheap, for 10 or 20 cents, but it was not easy to make 10 cents back then. My mom was illiterate but very intelligent and creative with how to survive. The economy was not rosy worldwide but it was much worse in Malaysia. There were originally ten children but some died earlier from different causes. We didn’t talk about it—too busy surviving. After we came here we talked and reflected on things we never did at home. Malaysian and English were the common languages but everyone spoke different languages at home. I spoke English but not as fluently before I came here. I spoke three Chinese dialects, Malay, and English, but not any Indian languages. If I wanted to play with other children I had to learn their dialects. I speak Cantonese, Fujianese, and Mandarin was spoken at my school. My own dialect is Hakka that we spoke at home. Malaysian English expressions and inflection are totally different. It was like United Nations in my family—we mix Hakka and English and we all know different Chinese dialects. The girls went to English speaking schools. My oldest brother went to a Methodist boy’s school. My younger brother and I went to Chinese medium school. We didn’t go to the free Malaysian school. My mother somehow managed to pay for our schools and books, I don’t really know how. My mother learned English in her 60s and she spoke three different Chinese dialects but she was illiterate. The Hakka culture and food—I am more drawn to that than Malaysian. My mother was a very good cook. People came to her with notebooks to get her recipes. She liked to cook pigs feet, stewed, sour with vinegar and ginger, dried oysters, soy sauce, onions, garlic. Her way of cooking pork chops and her fried pork was also very famous, marinated with special spices, hard to describe. Malaysian dishes are very spicy. Assam sweet and sour curry is another one. Later in life, everywhere my mother went she compared the price of food. It was a 17-hour flight to the US. We didn’t know what to expect when we came here, but we knew we wouldn’t go back. We emptied out all our money and sold everything. I haven’t gone back although some of my siblings have. It was definitely worth it. It was totally unexpected. My first impression, I was very surprised—it didn’t match my idea of America. We saw snow for the first time and we didn’t see people sipping champagne. We went directly to Tecumseh, Michigan, a farming town where my older sister owned greenhouses. A year later I came to Philadelphia where my sister had bought a house. I had many different jobs. I got a part time job at Drexel teaching Chinese, I did kitchen work, translation for Berlitz, and I was the councilor for a Chinese mutual assistance association. I was a court interpreter and translator for City Hall. It was kind of terrifying to have so much responsibility. They didn’t train you at all. It was supposed to be literal translation, but sometimes I had to stop and to ask questions because with two different cultures sometimes yes means no and no means yes. I was translating culture, not just language. My last job was with the government, the City of Philadelphia Human Relations Commission, which I did for 24 years before I retired.